It’s summer, so I’m pretty much in a ponytail, no make-up, and extremely casual clothes every day. Today was a white t-shirt, a black skirt, black sandals, and these goofy red tassel earrings that have probably seen their last Rêveuse Day. 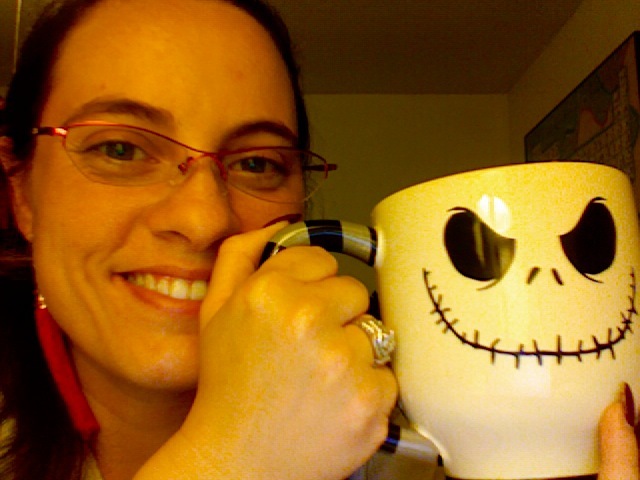 But I need caffeine to meet my deadline, so I’ve also got my new Jack Skellington mug! And why would you need a new one? you might be asking. Your old one was perfectly awesome in every way. I scoured the Interwebz trying to find a replacement, but alas, that mug is no longer available anywhere. So I got this one instead. Not the same shape, but also very cool, and it has gray and black stripes on the inside, which is nice. The best part, though? This mug is approximately the size of my face! It holds a wakeful 21 ounces! That’s a delightful lot of chai tea, my friends. So I’m going with it. Haha. 🙂 Doesn’t quite work that way here… 😉 I’m on to that trick! Oh, that’s hilarious! I loved that movie. I also love really large mugs. I don’t actually drink coffee, but I’m a big fan of tea, especially when I need a jolt of caffeine. Goofy mugs the size of my face are just awesome. On the other end of the spectrum, though, I’m also quite partial to very delicate demitasse cups. I have a gorgeous set I inherited from my grandmother that I like to serve drinking cocoa in. Turkish or Arabic coffee works well in them, too, but I don’t drink that. I think I just love mugs in general; especially kooky or logo-tastic ones. There are a lot of paint-your-own-pottery places here, and it’s always fun to go in and paint one with the kids. The last one I made was one of those Campbell’s Cup-o-chino types, and I put smiling lips on one side and smiling lips with fangs on the other. I plan to use it at school. Bahahaha! Terrify the students, but in a charming way. Er, I only meant to link to the first video. Not sure why the second one popped in there as well. Oh my god, I’m laughing so hard. That’s so sneaky!